The internet can be a powerful and convenient place for finding additional coupons, particularly if you don’t have regular access to a coupon flyer from a Sunday newspaper. In fact, I actually collect the vast majority of my coupons from the Internet these days. I still use other tactics in conjunction with this, such as the “one month” rule where I’ll wait a while before using the coupons I print. 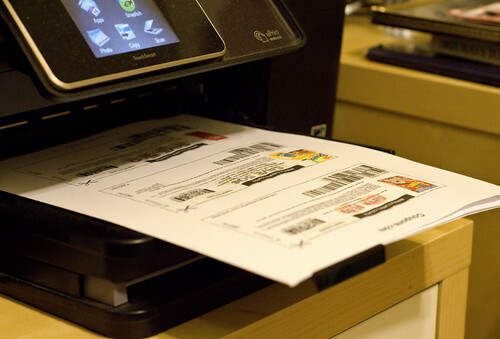 There are a lot of resources out there for finding coupons. I’m going to stick with the sites and tactics I use myself for collecting coupons online. If you simply want to replace your Sunday coupon flyer, the easiest way to do that is to just visit SmartSource.com and RedPlum (these are the ones I use – there are others out there). These sites mostly just replicate their Sunday flyers, allowing you to choose the coupons you want and print them conveniently. I usually hit these sites once a week. I used to use coupon aggregator sites like Coupons.com, but the offers there always seemed to be the same as the other sites and I didn’t like the additional software I was asked to install. I also hit the websites of the drugstore, household, and grocery retailers that I use, including Target, Fareway, Walgreens, and Hy-Vee. You can find your particular retailer with a quick Google search. Not only do I get the weekly flyers and coupons from the stores at those pages, I’ll also sometimes find internet-only coupons and other things of interest by visiting the retailer sites. If you often buy a very specific product, brand websites can help you sometimes find coupons for them. If I’m going to buy toothpaste, for example, and I was a very particular user of a certain type of Colgate, I might visit Colgate.com for a coupon before I bought a replacement tube. Sometimes, I’ll even do Google searches along the lines of “Health Nut coupons” or whatever specific item I’m looking for with the word “coupon” or “coupons” added to the end. Sometimes, you’ll find a coupon on a place you didn’t expect, like a blog. I generally don’t find sites that just list endless coupons without any filtering to be useful at all. Many coupon blogs list hundreds and hundreds of coupons without filtering – I just don’t have time to go through all of them. I want to be able to quickly narrow things down without having to click on dozens of links or read through tons of paragraphs. In the end, I wind up with coupons that match exactly what I’m buying – and those coupons really add up. Even better, I can do all of this searching at my laptop in the evenings or whenever it’s purely convenient for me.